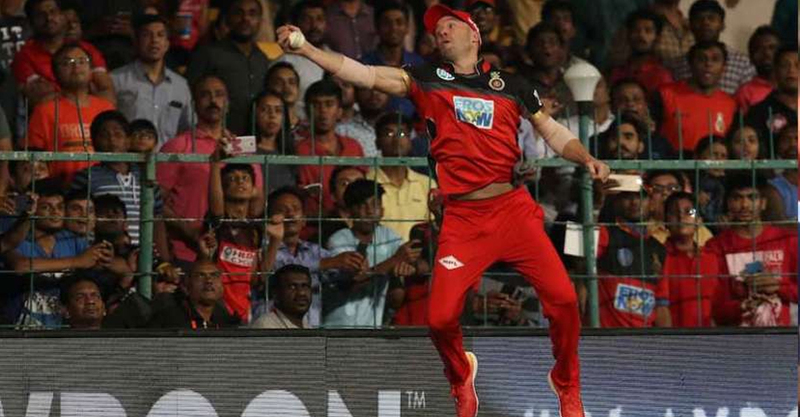 AB de Villiers said it looked tougher than it actually was but his gravity-defying boundary catch during an IPL match was declared “spiderman stuff” by an awestruck India and Royal Challengers Bangalore captain Virat Kohli. RCB defeated Sunrisers Hyderabad by 14 runs last night to keep their play-off hopes alive. The outstanding moment of the match was the one-handed catch that de Villiers took while being airborne at the boundary line to dismiss Alex hales. “AB’s catch was spiderman stuff, you don’t do that as normal human beings. His shots still leave me in awe, the fielding unbelievable,” Kohli said in the post-match presentation last night. “Now we head to Rajasthan with momentum on our side, the team’s feeling great. We’re happy with the XI now, it’s settled. Teams don’t want us to win, looking at the strength, they want us to not win. We sense fear and we pounce,” he said. De Villiers said he continues to be amazed by his popularity in the country, where chants of his name resonate every time he comes out to bat.